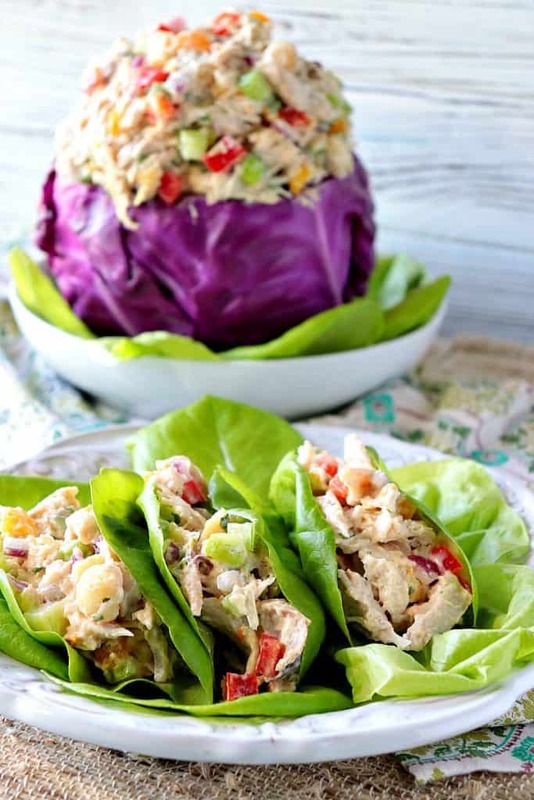 Sweet & Savory Creamy Chicken Salad Recipe with Dried Apricots & Macadamia Nuts makes a delicious summer meal when served in lettuce cups for a low-carb meal option, or between some delicious bread as a sandwich filling. However you choose to serve and eat it, you’re going to love this wonderful combination of flavors and textures. You can make this creamy chicken salad in advance and keep it in the fridge for up to 5 days. Once made, you’ll be ready to serve it up at a moments notice or to pack it in a cooler for a fun and tasty on-the-go picnic. **Please Note – The printable recipe card with detailed instructions and complete ingredient measurements for making Creamy Chicken Salad Recipe with Dried Apricots & Macadamia Nuts is available near the end of this post. 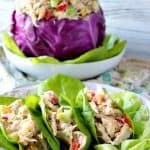 This sweet and savory creamy chicken salad recipe is one I developed because my husband and I started eating a low-carb diet. All the ingredients I’ve used are relatively low in carbohydrates, with the exception of the dried apricots. However, because there is only a small amount of dried apricots in this recipe (½ cup for 6 cups of chicken salad), and because dried apricots are also high in fiber, I considered them to be a healthy and flavorful option for this creamy chicken salad recipe. I find that a mix of dark and white meat chicken makes the best-tasting chicken salad. Store-bought rotisserie chicken is what I prefer when making a homemade chicken salad recipe. When using onions in a non-cooked salad, I enjoy a red onion and think it is the sweetest. You can adjust the amount of red onion in the recipe depending on your taste. Chopped shallots may be used in place of the red onion for a slightly milder onion flavor. Golden raisins make a good substitution for the dried apricots if you’re not a fan of apricots. When dicing the vegetables, make sure they’re all roughly the same size. I like mine to be about ¼” dice. Fresh orange juice and zest help to brighten the flavor of this creamy chicken salad recipe. I don’t recommend leaving these out. Other chopped nuts may be substituted for the macadamia nuts if preferred. Once the chicken salad is made, chill covered in the refrigerator for at least 4 hours so the flavors can marry and meld. Always stir well before serving. This creamy chicken salad can keep in the refrigerator (covered) for up to 5 days. 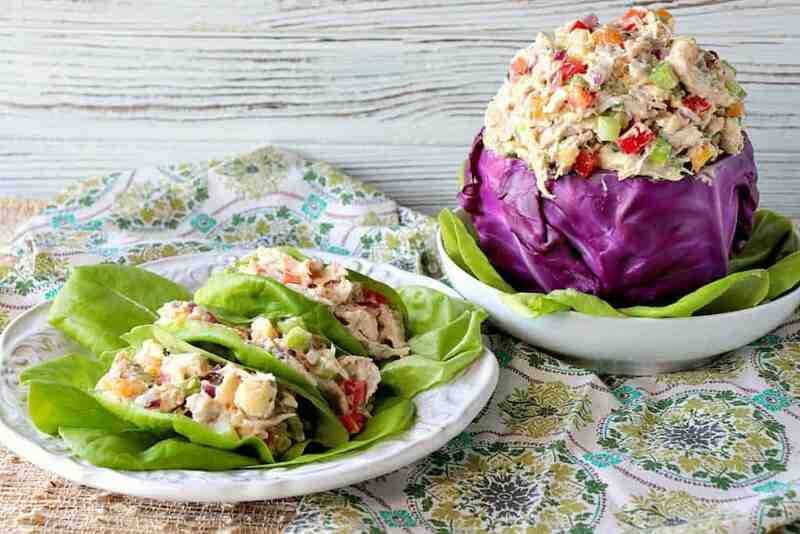 When serving chilled, don’t allow this chicken salad to sit out for longer than 2 hours without refrigerating. If serving on a hot day, don’t let it sit for more than 1 hour without refrigerating. In a large bowl, add 6 cups of boneless, skinless chicken, torn into bite-sized pieces. Stir in diced celery, red bell peppers, red onion, mayonnaise, and avocado oil. Chop and add the dried apricots, macadamia nuts, and fresh tarragon. Stir well to combine and refrigerate at least 4 hours before serving for the flavors to marry. Create a red cabbage bowl for presentation using a paring knife and an ice cream scoop, if desired. Serve on bread for sandwiches or in lettuce cups. Below is the printable recipe card for today’s Creamy Chicken Salad Recipe with Dried Apricots & Macadamia Nuts. If you’ve enjoyed this recipe, I’d appreciate if you’d take a moment to give this recipe some feedback by way of stars near the comment section at the end of this post. Thank you. 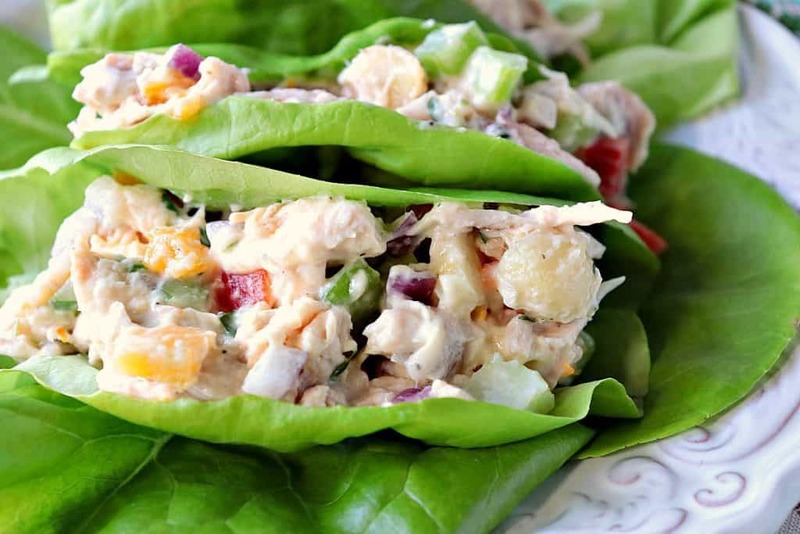 Sweet & Savory Creamy Chicken Salad Recipe with Dried Apricots & Macadamia Nuts makes a delicious summer meal when served in lettuce cups for a low-carb meal option, or between your favorite bread slices as a sandwich filling. Whichever way you choose to serve (and eat it), you're going to love this tasty combination of flavors and textures. Add the first 13 ingredients into a large bowl and stir well. 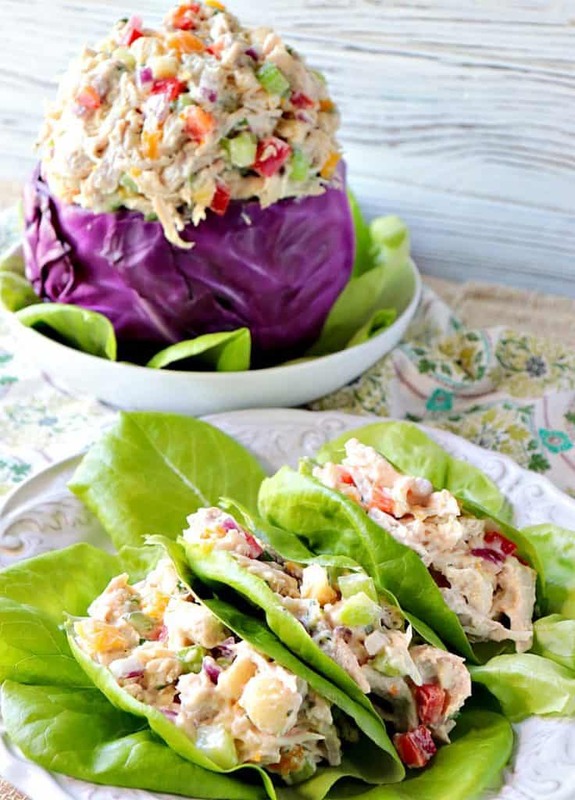 Cover and refrigerate the chicken salad at least 4 hours before serving. Serve chilled, on bread or lettuce cups. Stir well before serving. Keep this chicken salad chilled if serving on a hot day. cutting board, chef's knife, large bowl, wooden spoon or spatula, measuring cups, measuring spoons, microplane or zester, paring knife and ice cream scoop (for making the red cabbage bowl), optional. I sincerely hope you’ve enjoyed today’s Sweet & Savory Creamy Chicken Salad Recipe with Dried Apricots & Macadamia Nuts as much as I’ve enjoyed bringing it to you. This is easily my new favorite use for dried apricots! Such a fanastic and colorful dish! Thank you so much. It’s the colors that make it so flavorful! What a great chicken salad — always one of my favorite dishes! The apricots & macadamia nuts are fab here! 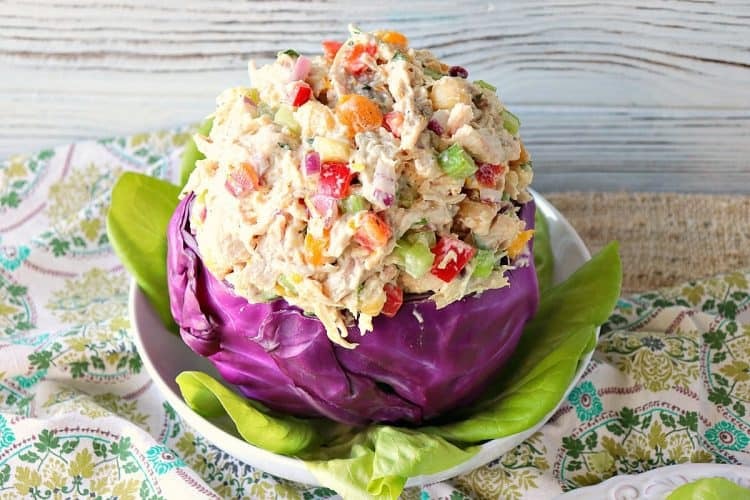 What a great chicken salad — always one of my favorite dishes! The apricots & macadamia nuts are fab here! Mmm!